When you think of the Christmas season do you think of cosy family time, everyone glowing from the warmth of the gathering and the festive cheer. Or does it make you think of horned satanic-like creatures ready to punish children and carry them off to the gates of hell? If it’s the latter, you’re all ready for Christmas in Austria. 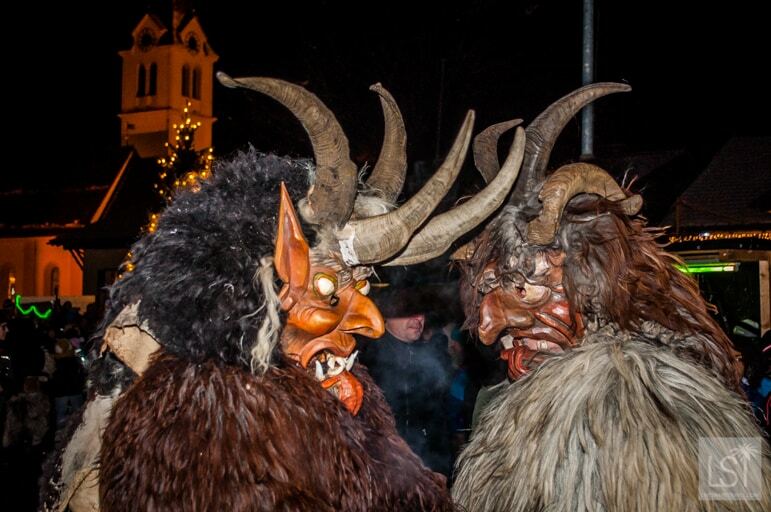 Or at least you’re ready to meet the Krampus, a traditional feature of Austria’s Christmas celebrations – but more on this in a while. 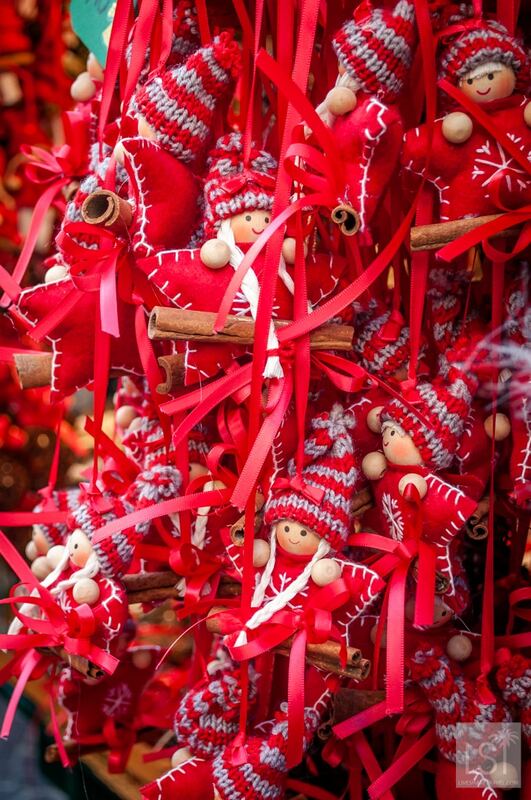 We have just returned from the Austrian city of Innsbruck where we took time to visit the local Christmas markets. 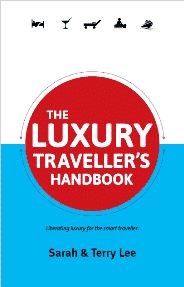 We have written in the past of our love for Innsbruck, and this visit only reinforced that – it is a city of rich history, yet vibrant modernity. We were last in the city in the summertime, but this time round in early December the chills of the season brought the comforting rosy rouge of winter to our faces. All around us local people were wrapped up for the occasion and woolly hats were omnipresent. 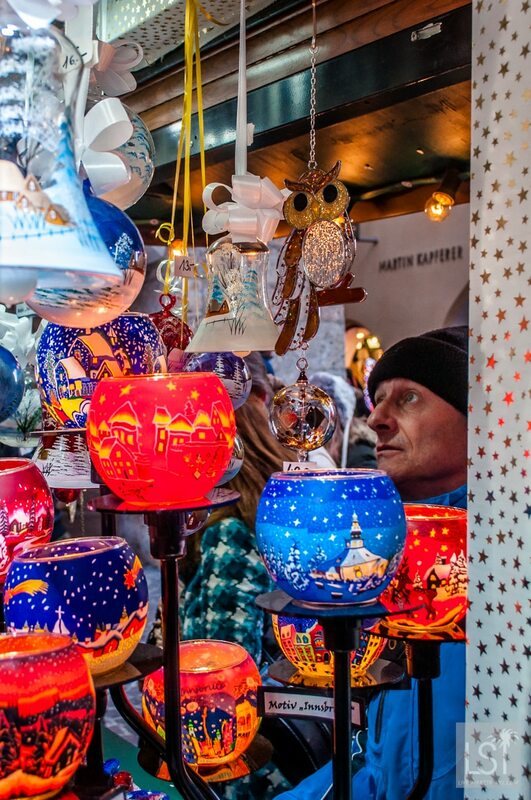 If you want your Christmas white and if festive comes with a chill in the air that can only be warmed with a glass of gluhwein, the capital of the Tirol is for you. 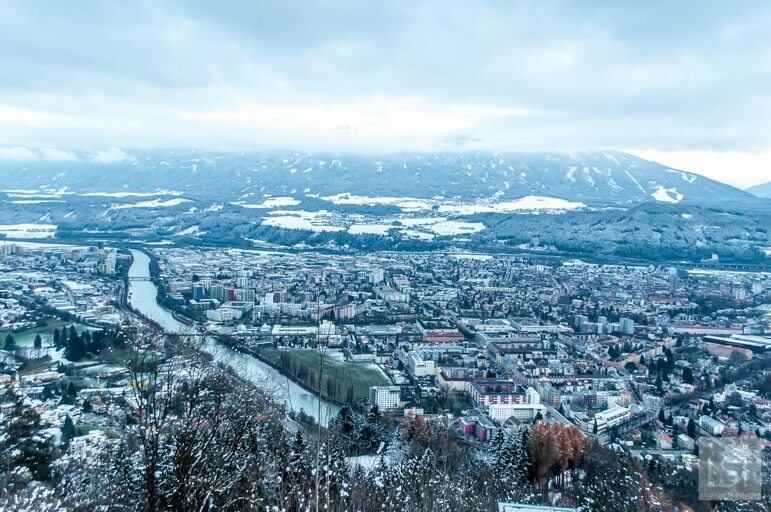 The snow covered mountains that surround the city beckoned us towards them, and our first Christmas market at Hungerburg at 857m in the Nordkette mountains. It is accessible by the funicular from the city centre. 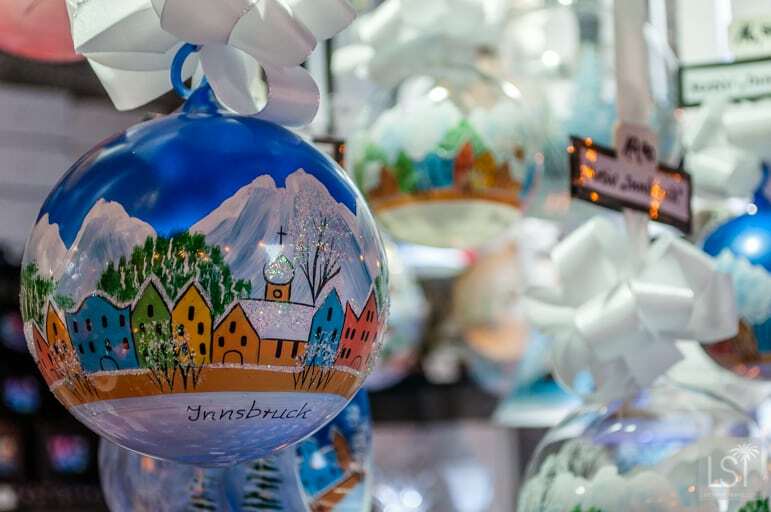 Once there we were rewarded with glorious views over Innsbruck and a relatively small Christmas market, but with a lovely atmosphere. 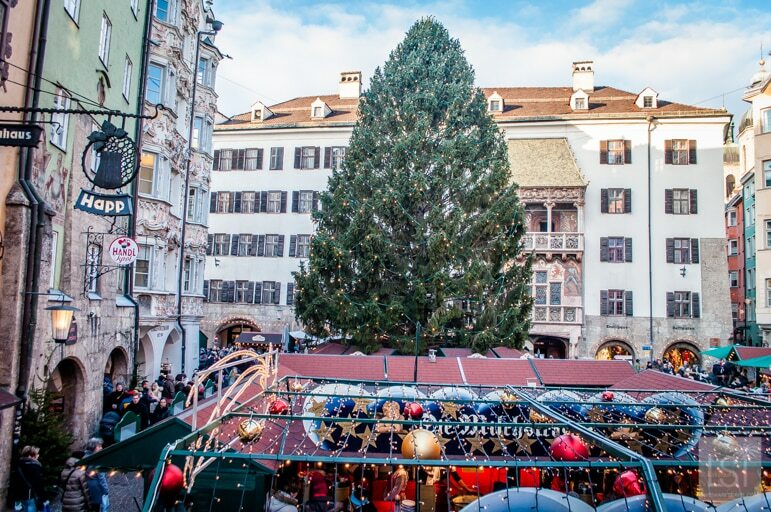 The next day we went to the centre of Innsbruck to the large Christmas market right in front of the city’s famed landmark, the Golden Roof. Here the stalls were filled with an array of goods, handicrafts and decorations and there’s even a viewing platform so you can see over the whole market from on high. 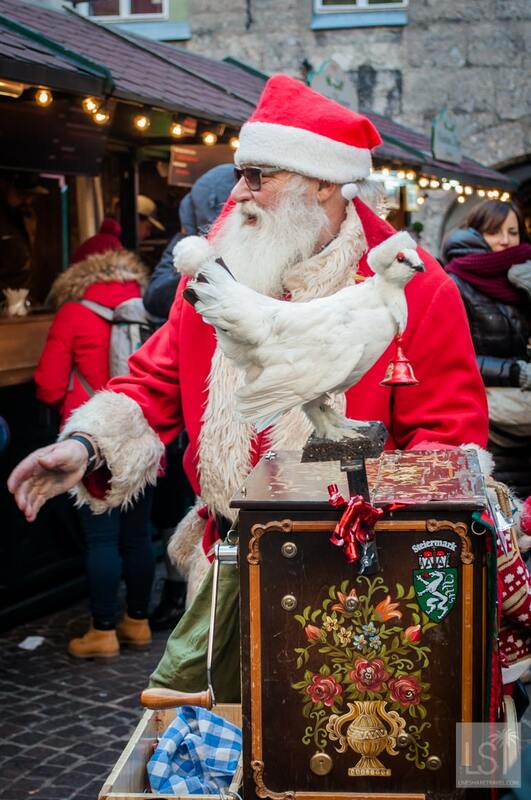 A special highlight for me was that I even got to meet Santa Claus as he paraded through the market much to the delight of the local little children, and also some of us bigger kids. 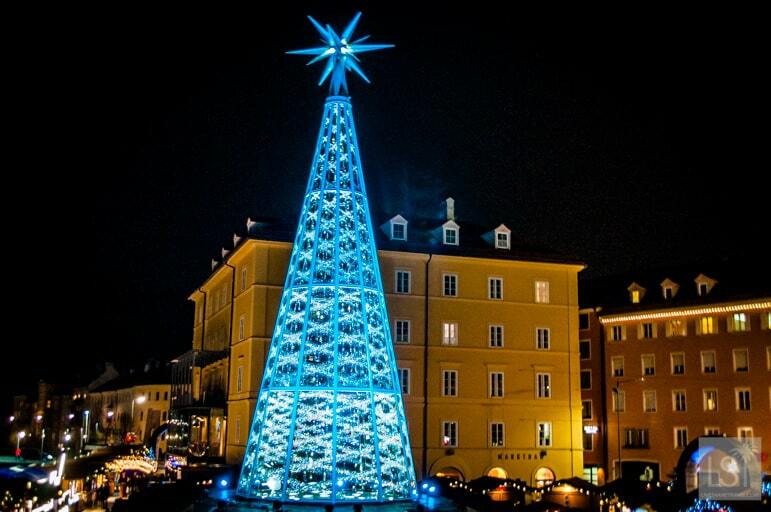 As we were in the region, which is home to crystal makers, Swarovski, it was no surprise to see an exceptionally sparkly Swarovski Christmas tree at the market in Marktplatz next to the River Inn. 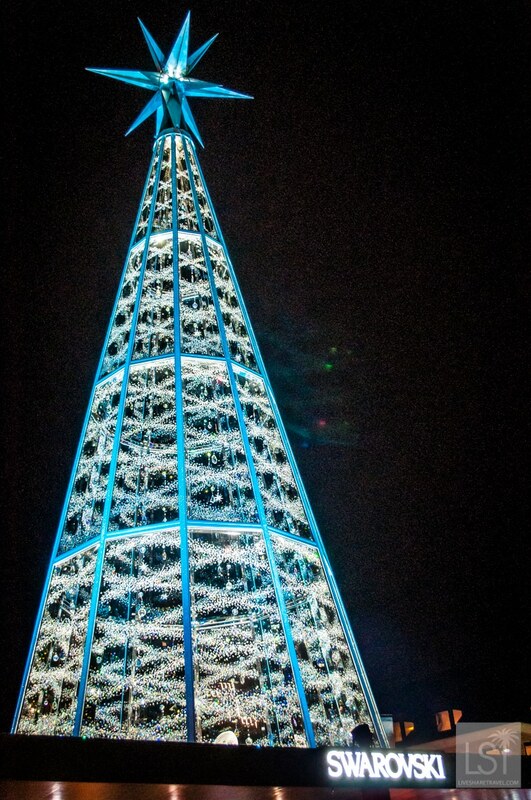 During the day the sun dazzled and danced off the glittering tree, but at night when fully lit up it really came into its own. We once again dived into the mulled wine and even a hot punch or two, all were mixed with an array of divine smelling spices. We did break away from the markets to take in an Austrian speciality and personal favourite – coffee and cake at Café Sacher. If you are going to sample the world renowned Sacher Torte cake, well in Innsbruck this is the place. Café Sacher is a traditional and elegant café and the setting makes for a cultural occasion as well as a much-needed refuelling stop. 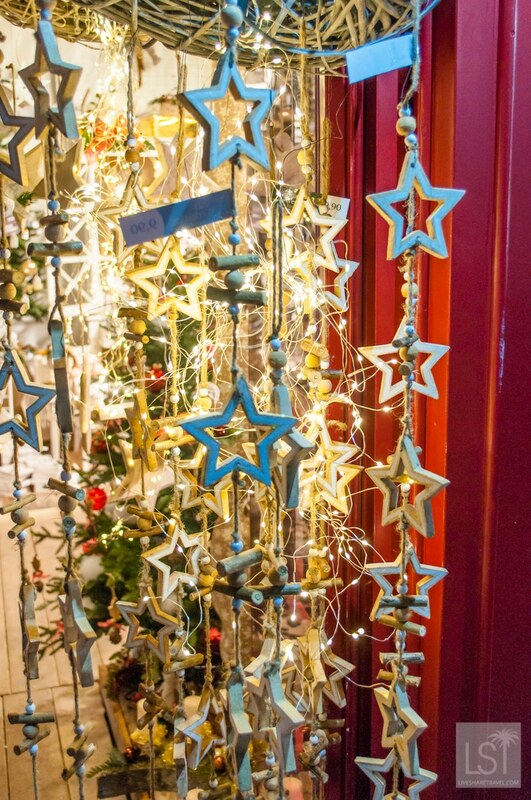 We came across an intimate Christmas market located on the lovely and ornate Maria Theresien Strasse. 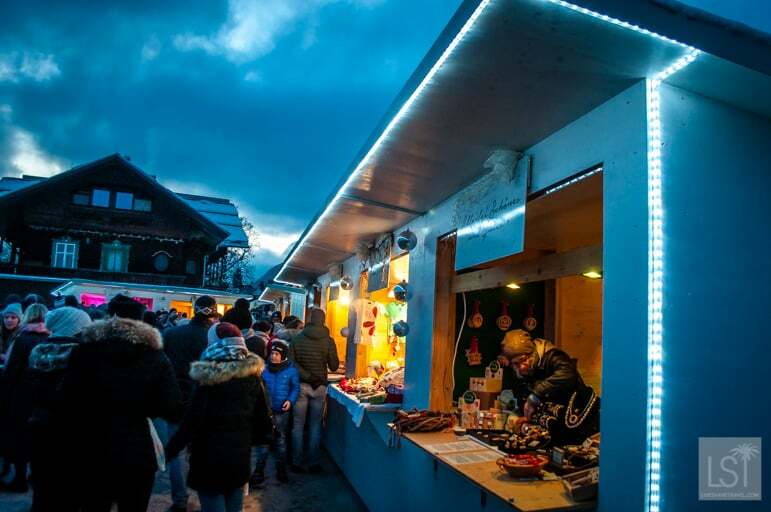 As with all the markets, there are a number of stalls with a hearty selection of foods just perfect for the cold climate. 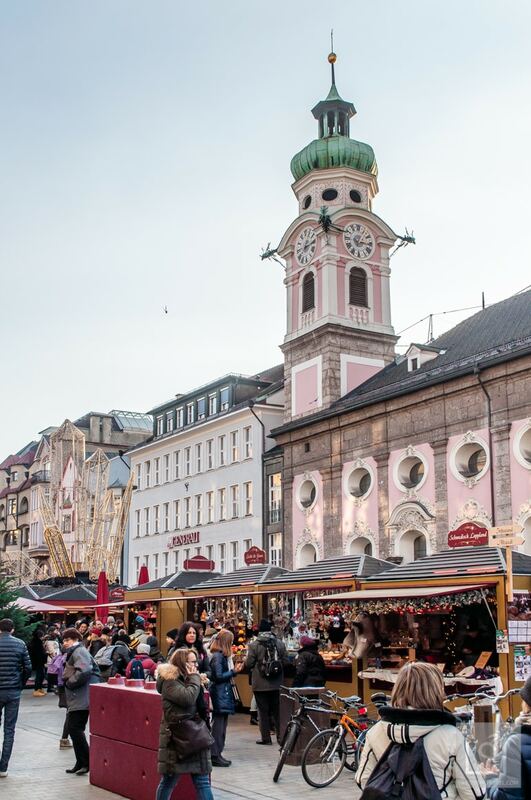 Locals and visitors alike were tucking into giant sausages, fried potatoes, roasted chestnuts, pastries and local foods like kaiserschmarrn – a delicious dough-based pudding served with plum sauce. 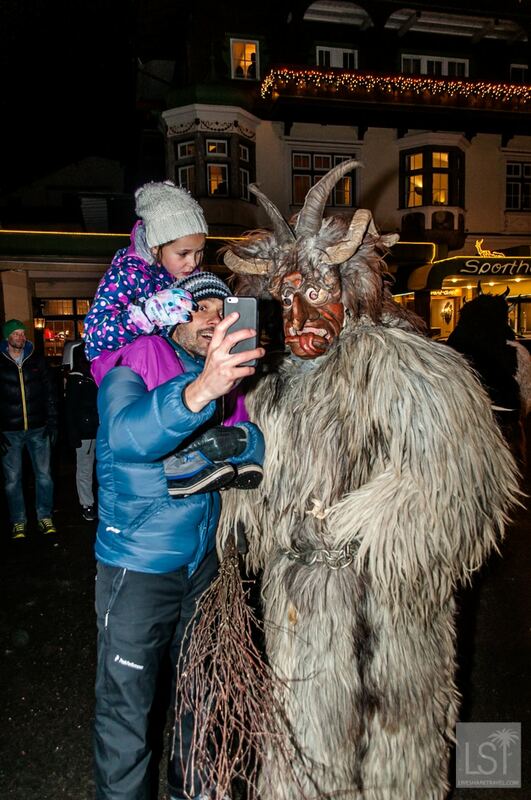 However, in order to witness Christmas in Austria in a different way, we had to experience the Krampus Run. So on a late Sunday afternoon, we took a short 15-minute bus ride to the small Alpine village of Igls. 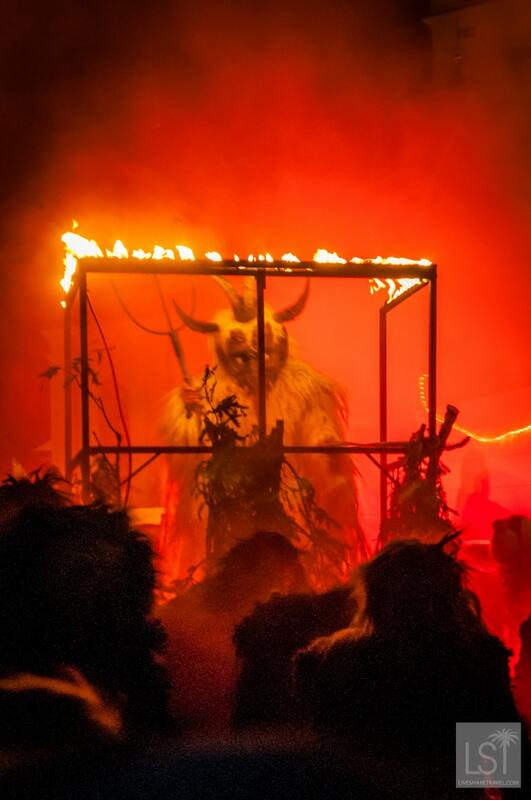 As mentioned, the Krampus Run sees young men (or at least we think they’re young men) dressed as demonic figures, frightening the bejesus out of people. 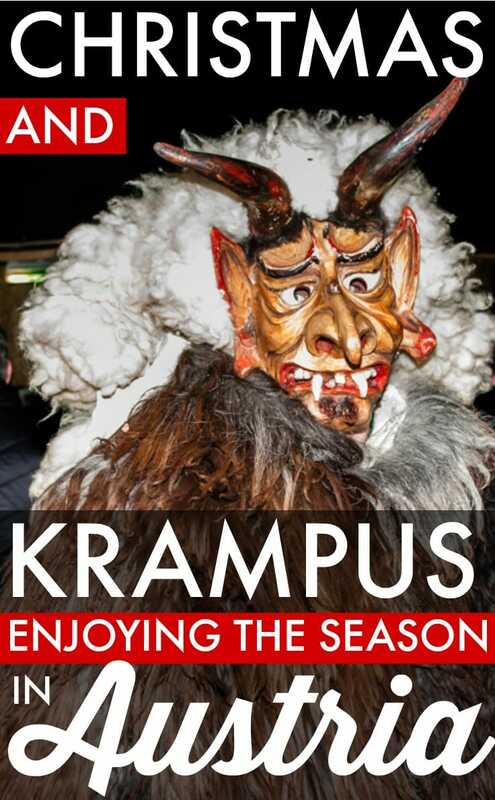 Krampus is the antithesis to Santa Claus. While good old St Nick smiles a rosy cheeked smile, brings festive cheer, and bestows presents on well-behaved children, the Krampus comes to punish those who have misbehaved. 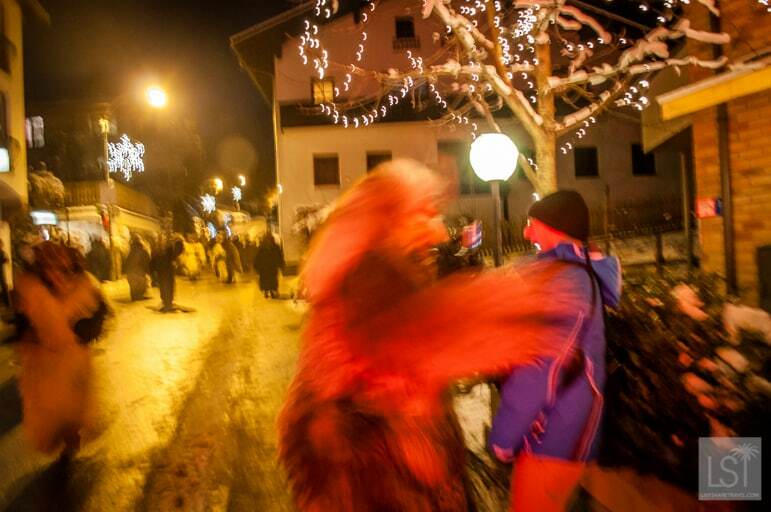 As we waited in the village square next to Igls’ small Christmas market the already freezing temperatures seemed to drop further. 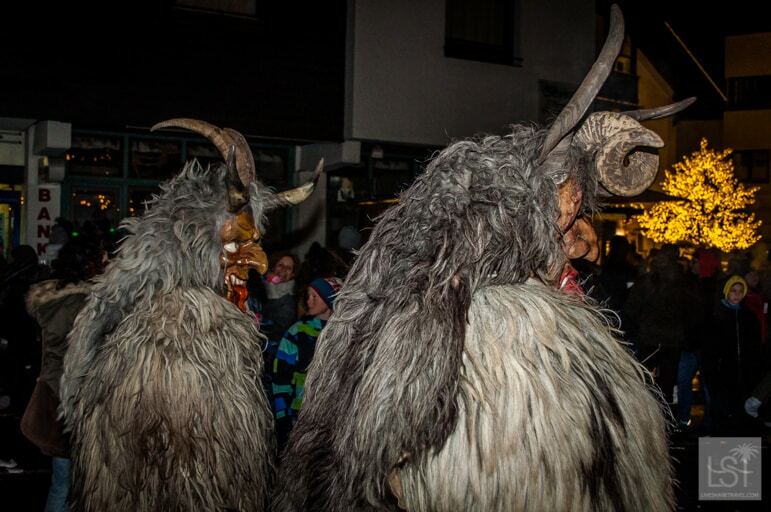 There was a stillness in the air, and then we heard the Krampus… a good while before we saw them. 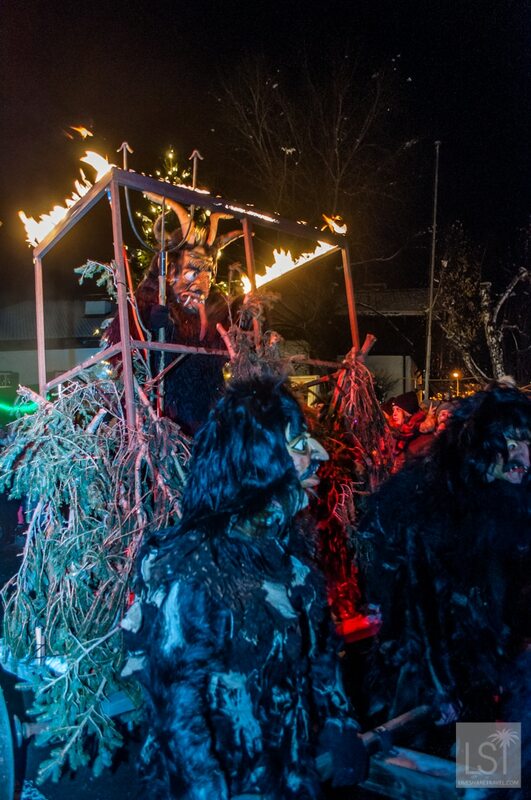 Their roars sounded in the distance and then a horde of Krampus, many pushing a wagon with flames shooting from it appeared among us. 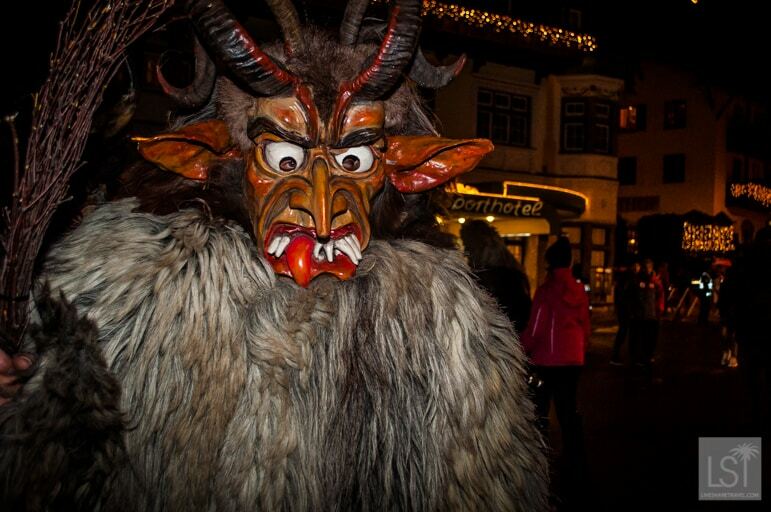 There were too many Krampus to count but each looked fearsome and the crowd loved it. 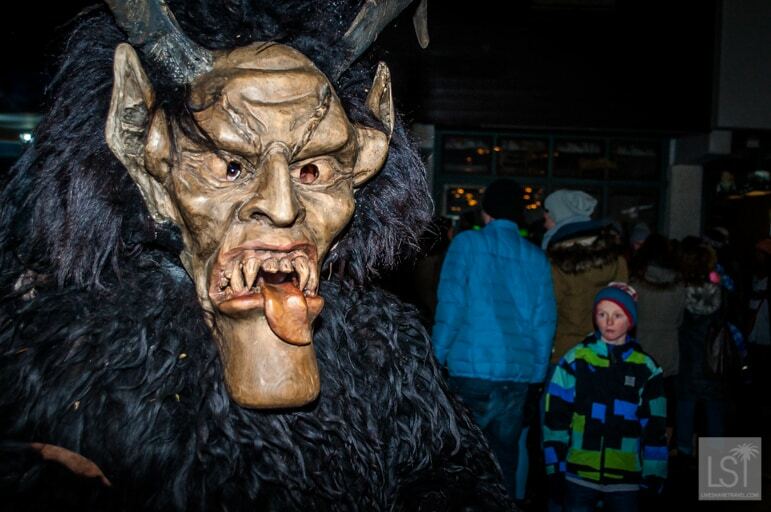 Some of the Krampus had cowbells attached to them, while others had a small bag or sack to carry off any naughty children. They all carried a bundle of birch to hit people around the legs with. 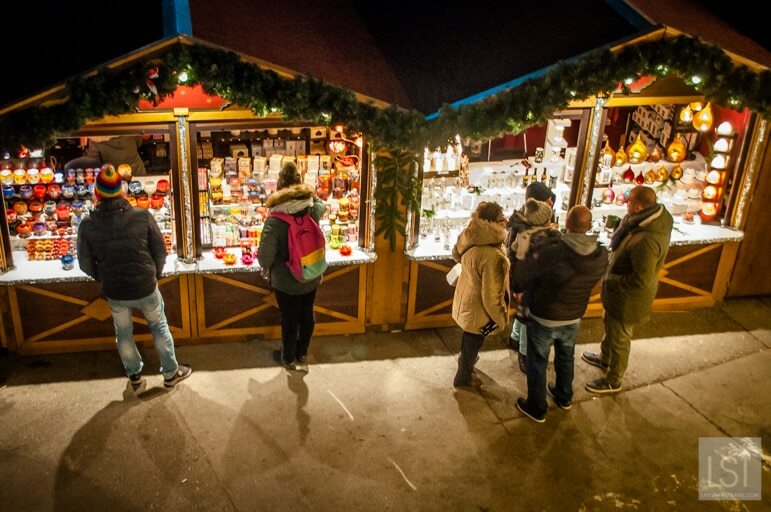 I’m sure if we were in the UK, Social Services would have something to say about it, but in Austria, it is a much loved and well-celebrated part of Christmas. From what we saw the kids were having a great time, and we certainly did too. After a short while, they retreated to whence they came and repeated their run into the village several times more. 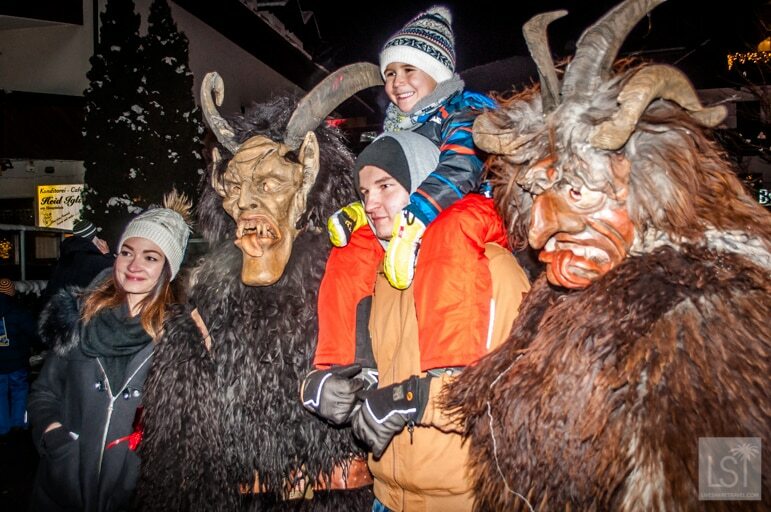 All the little children in their parents’ arms were greeted lovingly by the Krampus, but many of the teenagers, whom we assumed were known to the various Krampus characters, were whacked around the legs – as were Sarah and I. Being hit didn’t hurt but it did come as a bit of a shock as we were not expecting it. 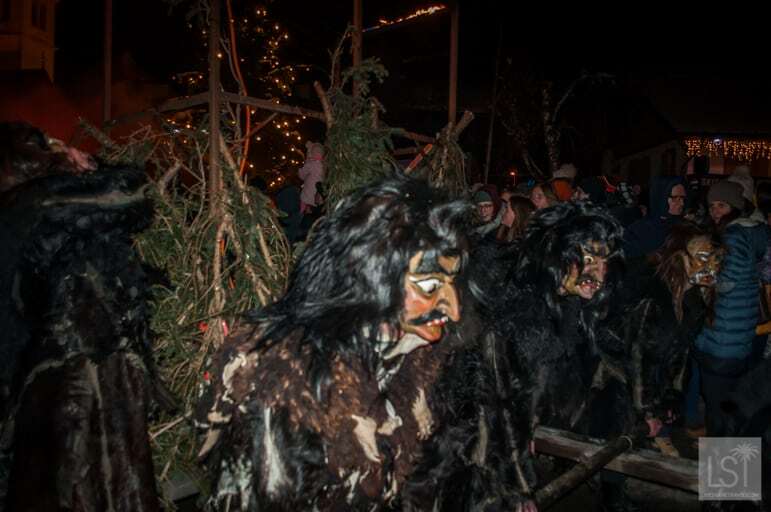 Our first Krampus Run was a revelation to us, but it was also great fun. 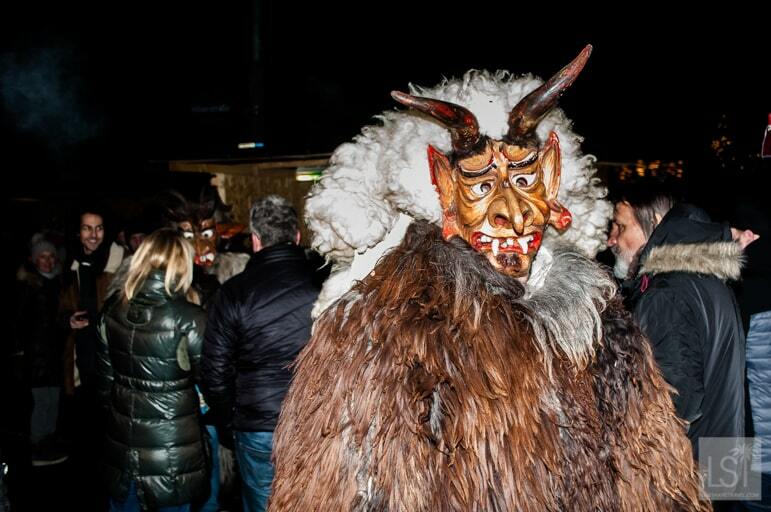 Christmas just won’t be Christmas in future without being confronted by a Krampus. 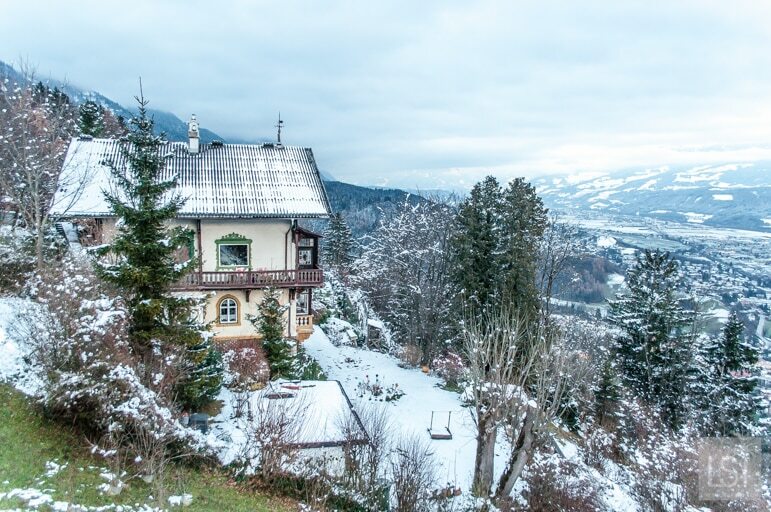 I think we will have to have Christmas in Austria all over again.